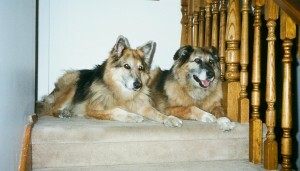 That’s Sable on the left in the photo above and on the right is her partner in crime, Soda. Ten days before I left Calgary to move to BC, I was packing up my office on a Saturday afternoon in early May when I noticed Sable – who was deaf and down to one eye at that point, having had the other one removed the year before due to glaucoma – bump into a box. That’s odd, I thought to myself. But she proceeded to lie down, have a short snooze and then went back upstairs. A few hours later, I was in the dining room when I looked up and saw her walk right into a large box by the back door. Then she just stood there, staring at the wall. I ran over, gently lifted up her nose and looked at her eye. It was cloudy and grey. I raced her to emergency. They confirmed she couldn’t see much at all – nor was there anything they could do about that. But they put her on more eye drops to try and keep the pressure from going any higher and we were to return on Monday for a re-check. By the time we walked out of the clinic, her vision had deteriorated enough that she fell off the curb. My heart sank. In the backyard at home, she proceeded to take a two foot swan dive off a brick ledge, right onto the concrete patio. Thankfully, a cushioned lounge chair broke her fall. And where was I, you ask? Watching, mortified, from the kitchen window. For this, I have no explanation other than I guess the reality of the situation hadn’t yet registered in my brain that being blind means not being able to see anything. Never a shortage of life experiences for a writer, I kept telling myself as the familiar tentacles of sorrow, anxiety and fear tightened around my heart. Would this mean the end of Sable? And if not, how was I possibly going to pack up the rest of my home – never mind the logistics of closing down my Calgary life – in time for the movers, who arrive in one week, while caring for a completely dependent blind dog? And not a small dog, I might add…although having a liftable purse-sized pooch suddenly seemed like a heck of a better idea than two German Shepherds. On the other hand, trying to see a positive side to this, at least it was better that Sable, the skinny super-model, went blind instead of Soda, the solid farm-girl built like a brick…well, you know. That night, I slept on the living room couch – feeling anything but positive – with Sable’s leash tied to my wrist. I woke up Sunday morning and, after a good sob, starting making calls to my family to get their perspective. “You’ll know when the time comes,” said one sister-in-law, referring to the unspeakable. Highly suspecting that time was near, various family members came by throughout the day to say goodbye to Sable, just in case. As for me, I cried and cried and cried as Sable pretty much just lay on the floor. When she did get up to eat, drink or go outside to the bathroom, it was excruciating to watch her bump into walls, boxes and furniture. He was right. And I started to feel that old friend, hope, fluttering to life. At the clinic the next day, the vet gave me a book on how to care for blind dogs. He also checked Sable’s eye pressure and it was stable! If the drops could continue to keep the pressure low, she wouldn’t have to have that second eye removed. Fast forward two months. My quality life has dramatically improved for a variety of reasons, many of which are directly related to what Sable is teaching me. The number one lesson I’m learning through caring for her is how to slow down. And by doing so, I’m getting a refresher course on patience, compassion, kindness and the importance of appreciating the beauty around me. I am amazed at how brave she is – and how much trusts me as her seeing eyed dog, even though I’ve let her walk into more telephone phones than I care to admit. I’m getting better though because I’m learning how important it is to focus on the task at hand. If I’m thinking of what I need to do when we get back home, then I’m not paying full attention to her immediate needs…and that’s when mistakes happen. This isn’t Sable’s first health crisis – the emergency clinic knows us well. My friend, Bob Fielder, has a beautiful magazine devoted to animals called CreaturesAll and he published a story of mine a few years back, called Saving Sable. That heartwrenching experience taught me the lesson of self-worth. As for Sable’s quality of life? Well, I just glanced out the sunroom window and she’s lying on her sheepskin rug in our new backyard, happily chewing on a rawhide. Maryanne Pope is the author of the creative non-fiction book, A Widow’s Awakening. She is the founder and CEO of Pink Gazelle Productions Inc and the Board Chair of the John Petropoulos Memorial Fund. Maryanne also writes short stories, screenplays and play scripts. She lives on Vancouver Island with Sable and Soda.